The UTAC brand is devoted to all institutional activities, covering regulatory affairs, approval, roadworthiness and certification. The CERAM brand is devoted to all technical activities through development & validation, covering all the associated skills and resources of the Linas Montlhéry and Mortefontaine sites. The fields addressed by CERAM are the environment (energy, emissions, noise, vibrations and electromagnetic compatibility), active and passive safety, plus endurance and reliability. 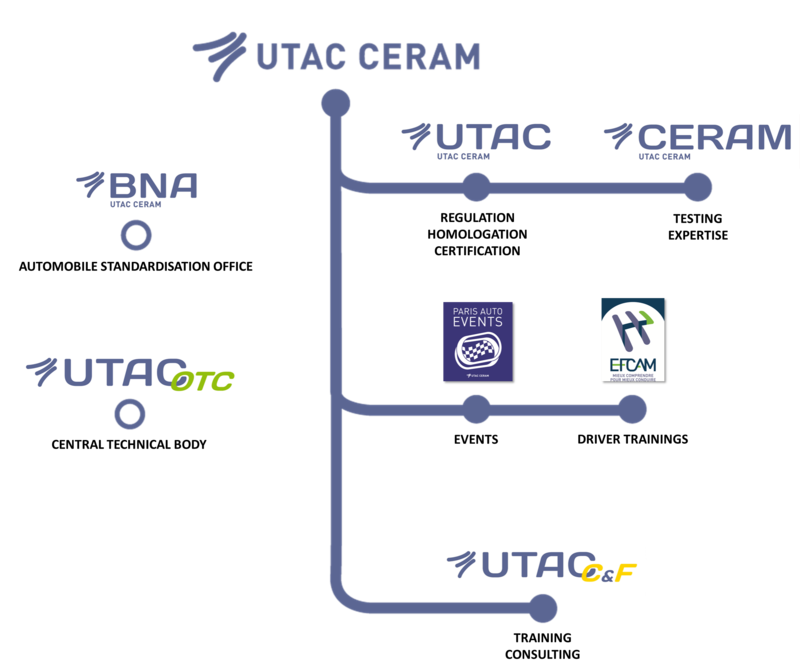 All the track activities are integrated into CERAM. Events and Training includes the Paris Auto Events and EFCAM brands, which are experts in the organisation of events, incentives, track and facilities rental, in driver training and sports driving courses. Consulting and Training is dedicated to customer support, providing them with a whole range of services contributing to optimising their performance. Keeping the elements used to adapt test equipment and methods to technical progress up to date, as well as the information and the inspector’s training.